It is with great pleasure that we inform you about the latest developments at McCann. "McCann Quality Transport bvba" continues the transport activities as from the first of August 2016 under the expert guidance and management of Joy Vermeire, Clio Vermeire and Kenneth Versluys. Following several years in search of the right system and partner, McCann finally met up with Transics as preferred supplier providing a track and trace system tailored to our business. Several systems were previously tested but durability remained a problem. Transics solved this problem and presented a durable and accurate track and trace system linked to our TMS system. With great pleasure we can announce that as off 2016 our entire trailer fleet is equipped with track and trace by Transics. In today’s high demanding transport industry, time is of the essence and combinations must be followed and planned real time to avoid pointless empty kilometers. Equally customers need to be able to know the whereabouts of their cargo at any moment during the transport process. 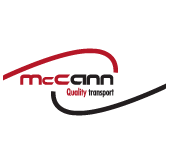 Not only is McCann able to tell its customers just that, the implemented track and trace system allows our planning team to be even more pro-active, offers a highly appreciated service to our customers whilst additionally streamlined combinations and avoided empty kilometers help impact emissions standards.